The debate about effects of Barnett Shale drilling and production on air quality in the Dallas-Fort Worth area continues. The debate started when Al Armendariz, then a professor at Southern Methodist University, published a study in 2009 concluding that increased drilling activity in the DFW area would greatly increase polllution and ozone levels. Armendariz postulated that in the nine counties included in the D-FW metroplex area, gas drilling produced about 112 tons per day of pollution, compared with 120 tons per day from vehicle traffic. His study was sponsored by the Environmental Defense Fund, and was heavily criticized by industry. Armendariz was later appointed head of the Dallas office of the EPA, and resigned earlier this year amid Congressional criticism of remarks he made about EPA enforcement policies. As a result of Armendariz’s study, the Texas Commission on Environmental Quality installed automatic air monitors at locations within the Barnett Shale area. Eight automatic gas chromatographs now sample air twenty times each day for 46 volatile organic compounds. The monitors cost $250,000 each and cost $100,000/year to operate. Readings from the sample analyses are posted by the TCEQ and can be found here. According to an analysis by Powell Shale Digest, none of the 236,120 air samples taken by these devices have shown amounts of VOCs exceeding limits set by the Environmental Protection Agency. 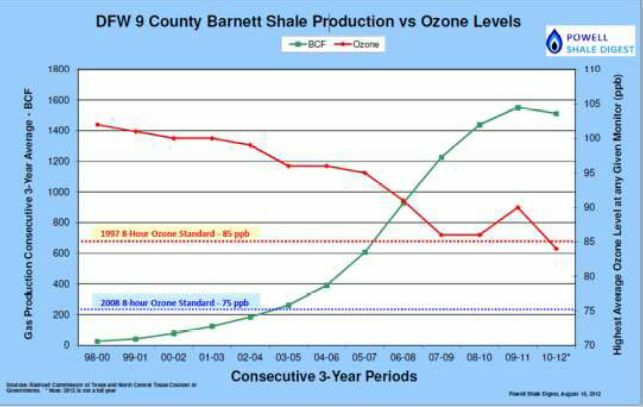 This scientific data from millions of tests run by the TCEQ in the Barnett Shale plus the shale gas production plots against the ozone levels show no influence caused by shale gas development and production on air quality. The Barnett Shale area of north Texas has been the most thoroughly tested air quality of any industry. This scientific data plus thousands of other tests run by the TCEQ laboratories in Texas totally contradict the fear of polluted air quality caused by shale development in the United States and throughout the world.